A glass-half-empty view of bacterial news: germs, disease, death. We need an antidote to this negative perspective. Dr. Trudy Wassenaar, author and curator of the Virtual Museum of Bacteria, provides it. Her view of life without bacteria (if even possible) is worse. She sees her book as an antidote for bacterial bad news, and the dosage is 182 pages of bacterial wonderment. 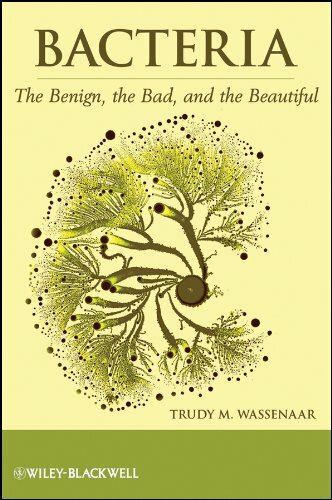 Within the pages, she celebrates bacterial diversity, and quite humorously explains how bacteria feast on other species, move, and reproduce. She leads the reader through stories detailing how bacteria are everywhere, how long they’ve been here, how they have affected artists, writers, and their work. The story of bacteria as tools to create art is also told. Despite the author’s enthusiasm for bacteria, the chapter titles are rather banal: The Blue Planet; Tree of Life: Let Three Live; How Old are They? ; On the Move; Needles; Dead or Alive; Nobel works; Bacteria and Insects; Bacterial Toxins; Enzymes; Genetics and Genomics; Antibiotics and Resistance; Marine Microbiology; Bacteria and Oil; Extreme Life; Record Holders; Bacteria and Art; Fixing the Air; Pest and Pestilence; Our Bacteria; Sensing Bacteria; Bacteria and Mankind; Big Questions on Small Subjects; Synthetic Biology; Bacteria, the Earth, and Beyond. Yet they are straightforward and written in a unique and comical voice. Some jargon is unavoidable, but the concepts are well illustrated, and a glossary is provided. A bibliography and index are also included—helpful to the uninitiated or those interested in further reading. Several stories provide quite a picture of bacterias’ effects. Imagine yourself being a fruit fly, eating with your date at your favorite place. You have both eaten here before and like the same foods. You are really into each other—you could potentially mate. A scientist gives you antibiotics that night. Ever since then, the lady drosophilia can’t stand you and mates with someone else. In the chapter Bacteria and Insects, Dr. Wassenaar explains how the intestinal bacterial microflora of a fruit fly (affected by diet) drives mating preference. The reader will, no doubt, wonder if this applies to humans. Other interesting descriptions of bacterias’ effects are scattered throughout the book. In Bacterial Toxins, the reader can learn how toxins can lead to either bad or good effects. In Extreme Life, the reader will become aware of bacteria’s existence for hundreds of millions of years—within the earth’s crust, within the oceans, within rock—feeding on hydrocarbons below the ocean floor (up to 10 kilometers below sea level), and within artic ice. Various bacteria can even withstand arid conditions and extreme radiation—all because of incredible adaptive mechanisms. For readers with a science or microbiology background, there will be lots of, “How interesting! I didn’t know that!” moments. The cover art depicts the work of Eshel Ben-Jacob. His photographic work on the growth patterns of bacteria (as affected by growing surface, quality and quantity of food) is fantastic. Color plates in the middle of the book provide several examples. Detailed watercolors by Karoly Farkas are also included. The illustrations within the chapters, also by Karoly Farkas, however cute, were not beautiful, but brought to mind the cartoonish drawings placed randomly within the New Yorker magazine. The color plates were more illustrative of the overall beauty of bacteria. By focusing on the beauty—a glass-half-full view of bacteria—we have a remedy for bad bacterial news. Bacteria are fascinating little creatures that are deserving of the stories contained within Bacteria: The Benign, the Bad, and the Beautiful. The reader’s viewpoint may very well change after hearing them.